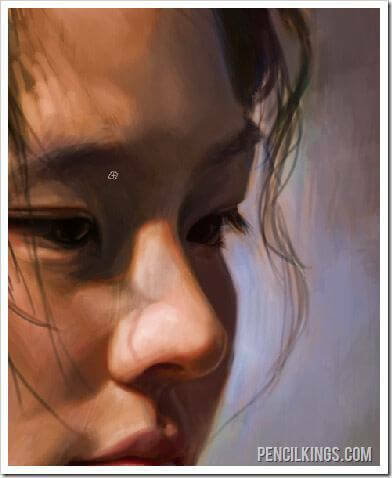 Here is the final image for this lesson series on digital portrait painting techniques. 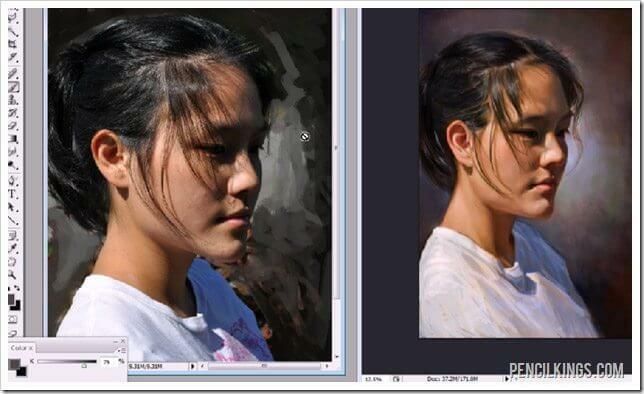 Ready for some more professional digital portrait painting techniques? In order to see the larger values in your works more clearly, you can squint your eyes. This is going to allow less light to pass into the eye. Within your eye there are two types of cells – Rods and Cones. Cones are responsible for you seeing color and the function best in bright light. Rods are responsible for seeing value and function better in dim light. When you squint your eyes you lose some of your ability to see color, but you gain a much better perception of values and edges. 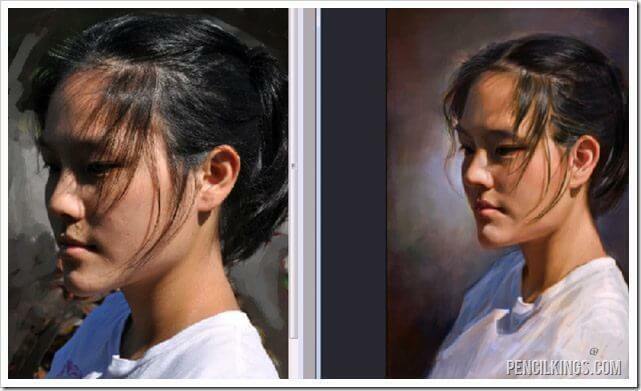 This is beneficial to us when learning digital portrait painting techniques, because as an artist, we can squint and then see the edges and major forms more easily. Sometimes it’s as important to get rid of detail as it is to add detail. Anywhere that you add a lot of detail or has a lot of contrast will attract your eye. 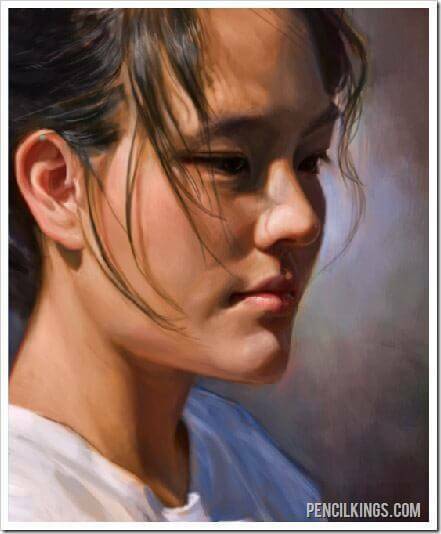 Simplify those areas that you don’t want the viewer to focus on and work to add detail to the most important areas of your painting. In general the focal point will be the area that has the most contrast, as well as the richest color. 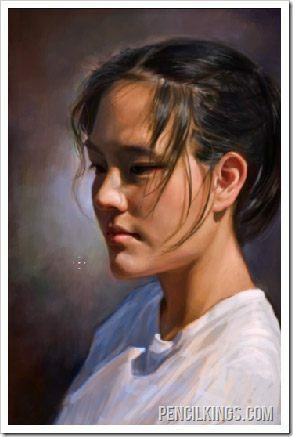 In this painting the focal point is the eye, and the shadow around the eye, as well as the lightness of the nose helps to draw the viewer into the eye. The eyes are an easy focal point to have because as people we always look into the eyes of others. 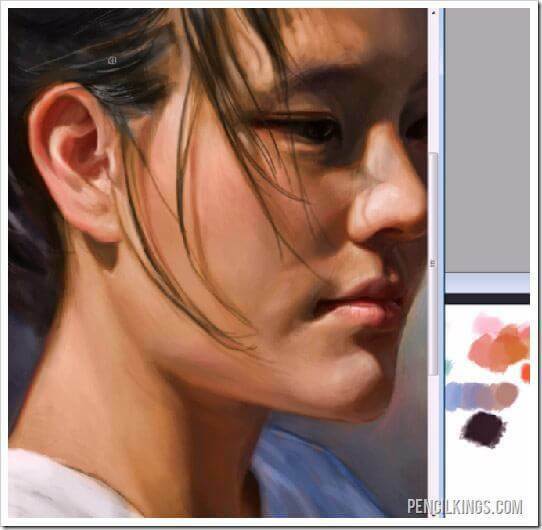 We hope you’ve learned a lot of digital portrait painting techniques in this article. Why not check out our other tutorials?